Clokall Builders & Decorators - Bathrooms, Bedrooms, Builder, Kitchens based in Windsor, Berkshire. 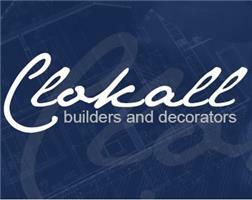 CLOKALL BUILDERS & DECORATORS IS AN ESTABLISHED BUILDING AND DECORATING COMPANY RAPIDLY EXPANDING OVER THE LAST DECADE. WE HAVE A FULL TEAM OF RELIABLE, TRUSTWORTHY WORKERS FROM ALMOST EVERY TRADE IN BUILDING. PAINTING AND DECORATING, INTERIOR AND EXTERIOR. .......................... WE ARE ABLE TO PROVIDE YOU WITH A COMPREHENSIVE ESTIMATE ON ALL YOUR BUILDING, PLUMBING, HEATING, JOINERY AND DECORATING NEEDS. I AM HAPPY TO LIAISE WITH BUILDING CONTROL/PLANNING THROUGHOUT WORKS TO YOUR HOME IF THEIR INVOLVEMENT AND INSPECTION IS REQUIRED. We cover all KT1 - KT24 postcode areas and we cover most of the Surrey and London area.